Is 855 a Toll Free Number? 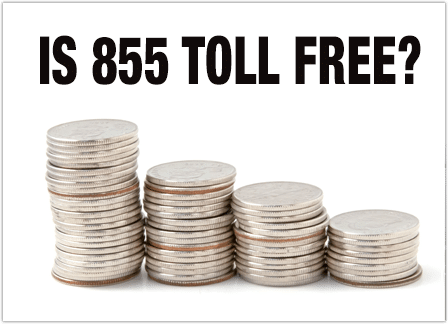 Update 2017: Are you wondering: Is 855 a toll free number? Or is 855 toll free in the same way that traditional 800 toll free numbers are? The answer to the question is yes! An 855 phone number is an 855 toll free number. And to answer the question: is 855 toll free to callers, the answer is again: Yes. When callers call an 855 toll free number the call is toll free. All 855 numbers work exactly like toll free numbers with the prefix 1-800. You can use the UniTel Voice toll free number search tool to find the perfect toll free number for your small business. Are 855 Numbers Toll Free? 1. Is an 855 toll free number different then a 1-800 toll free number? An 855 number is no different than a toll free number with the prefix 800. In fact, 855 numbers work the same way all 800 numbers for sale do and are protected by the same porting rules as all other toll free numbers. 2. Are 855 numbers used in the same way as 1-800 numbers? All 855 phone numbers are toll free in the same way 1-800 phone numbers are and an 855 number gives your business the same kind of credibility and nationwide presence as a traditional toll free number. They are widely used by small businesses and Fortune 500 companies alike. 3. Why were 855 phone numbers released? In order to allow more businesses to use toll free numbers, the FCC released the toll free number prefix 855 for business to use. Since the 855 numbers were first released in 2010, they have been very popular. In fact, they have been so widely popular that the FCC has since released 844 numbers and 833 numbers to keep up with the demand. 4. Can I get an 855 toll free number that spells a word? Yes, you can get a custom 855 number that spells a word or phrase of your choice. In fact, it’s way easier to get a vanity 855 number than it is to get a custom 800 number because there are simply more 855 numbers available in the spear pool of vanity toll free numbers. 5. Why should I use an 855 number over an 800 number? There are two reasons: 1) 855 numbers are newer than 800 numbers and therefore, there is a larger selection of available toll free numbers with the 855 prefix than there is with the 800 number prefix. And, 2) 800 toll free numbers have been around so long (since the 60’s) that almost all of them have been recycled several times. This means, if you use an 800 number you may be subject to random calls from people trying to call the previous business who used the number in the past. Could be old customers calling you or telemarketers… either way it can be a pain. UniTel Voice can help filter those annoying calls using a virtual auto attendant. Chat with us to learn more. 6. Why does UniTel Voice us a toll free 855 number instead of an 800 number?